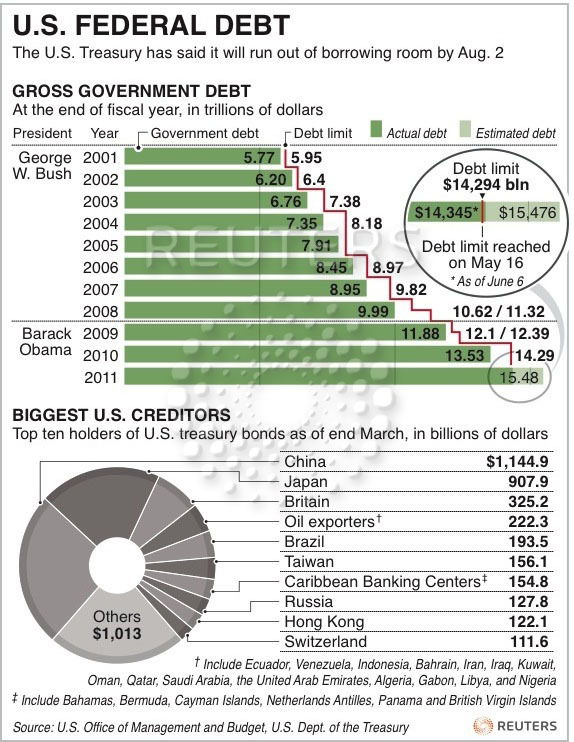 China notes that the United States is “playing with fire” if it agrees to default on its debt. Quite unwittingly and a bit reluctantly this will most definitely force countries like China to try to prop up the USD by purchasing more and more of the defaulted treasuries as they get dumped (mostly by US domestic holders of such treasuries). What a debt trap! 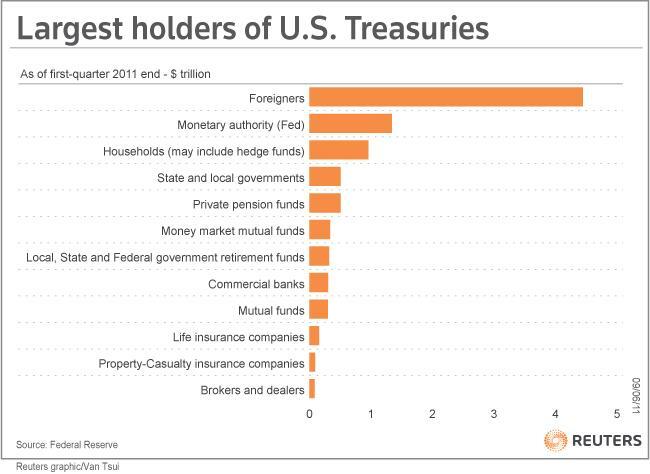 China seems to have invested as much as 70% of its $3 trillion foreign currency reserves in US Treasuries! The posture taken by the Chinese is all about their concern that the money that they have invested in US Treasuries is safe, the reality is that the US wouldn’t care as much even if a “technical default” causes a fall in the USD. But countries exporting to USA would get killed – therefore in order to protect their exports, countries such as China, Brazil, even India, might be prompted to buy more to help hold down their currencies from appreciating. The picture on the right shows the distribution of the lenders to the US Government. The main worry of the US would be that such a technical default would likely cause a ratings downgrade which would in-turn increase funding costs; raise interest rates; depress house prices and slide the economy back into a recession. And of course crash stock markets and shoot up gold. US benchmark 10 year Treasury yields are already hovering near their historic lows of 3%. Now, just what trigger would these notes need to start yielding higher again? A massive sell-off? Assorted articles on the internet (I’ve pulled most of the ideas for this post from Reuters) seem to be placing the chances of a US default at near zero and many people are obviously dismissing the idea as ludicrous – but stop and think about what would happen if this really plays out like this. We’d know by mid August when some chunk of treasuries are up for redemption and payments. 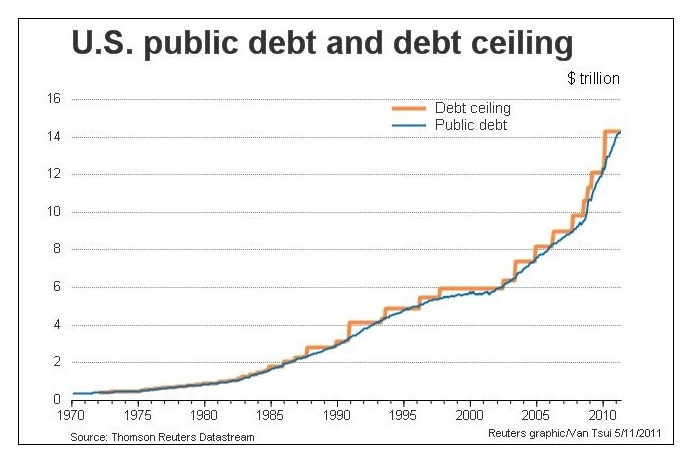 The chart on the top (click to enlarge) shows the US debt levels and the corresponding increasing in its debt ceiling levels. Now, the US Government cannot borrow more than its debt ceiling level and since it breached that level in May 2011, the Senate needs to vote in an increase of the debt ceiling. The reason why people are calling for a “technical default” is that a delay in voting for raising the debt ceiling may give time for economic forces to play themselves out and things to settle and solutions to emerge. Like a cooling off period. Before upping the ceiling. Most certainly it sounds like the political opponents of President Obama trying to generate real bad press and image for him by making the US Government “default technically” and then coming in to the rescue by voting to support the resolution to up the ceiling. That may be why the Treasury Secretary and the Fed people are saying that the results to the world economy will be disastrous if the US defaults. While the idea of the US defaulting does indeed appear crazy, nitpickers are therefore qualifying a “technical default” as being a different situation as compared to a real “failure to pay” kind of an event. The latter is catastrophic. The former is more like a pause that people do when enjoying a lavish luncheon buffet. They pause for breath, beam at their table-mates and reach out for their wine or water to catch their breath. Continuous eating, while supplying loads of calories, can be quite tiring. It also makes you a glutton. Take a look at this chart that I’ve sourced from Reuters (US online edition). How long can someone keep eating and eating and eating?